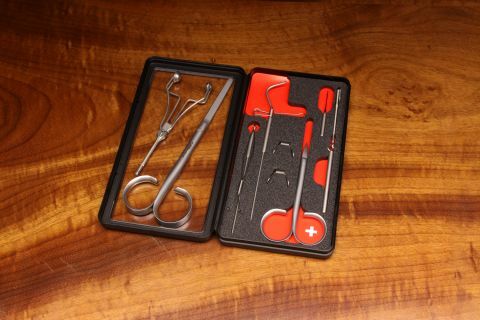 This set contains the following:- 2 Loop Clamps, Dubbing Needle, Hackle Pliers, Whip Finisher, Loop Twister, Small Scissors and Large Scissors plus #25 TT Bobbin all contained in the Protective storage box. Large scissors are perfect for cutting long straight edges and are ideal for use with the Magic Tool. A quality tool set to use for a lifetime of flytying.